Dead Horse Ranch State Park is located adjacent to and across the Verde River from the community of Cottonwood. It is centrally located near several major population centers such as Flagstaff, Phoenix, and Prescott. When using Dead Horse Ranch as a base, one has a variety of attractions to visit, including: Jerome State Historic Park, Fort Verde State Historic Park, Red Rock State Park, Slide Rock State Park, Tuzigoot National Monument, Montezuma Castle and Well National Monuments, Oak Creek Canyon, Prescott National Forest, Coconino National Forest, and the popular towns of Sedona and Jerome. Calvin “Cap” Ireys purchased Dead Horse Ranch in 1950. “Cap” told State Parks Director Dennis McCarthy that his children named the ranch. The first time the family looked at the property, they saw a dead horse lying in the field, and after looking at a number of properties “Cap” asked them which one they liked the best. The answer was the one with the dead horse. After they acquired the property, they named it Dead Horse Ranch. By 1971, “Cap” Ireys was ready to sell his ranch. He contacted Duane Miller, another rancher in the area, who was at that time serving as Chairman of the Arizona State Parks Board. “Cap” requested that Duane talk to the Parks Board to see if there was any interest on the part of the Board to acquire his property for a State Park. Mr. Miller contacted Director McCarthy and asked him to talk with Mr. Ireys concerning the potential of his property as a State Park. 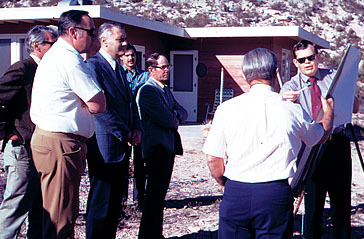 The Board visited Dead Horse Ranch on October 25, 1971. Director McCarthy reported on his meeting with Mr. Ireys, who had tentatively offered to sell 285 acres of the ranch comprising riverfront, pasture land, and bluff areas for $125, 000. Of the pasturelands, approximately 78 acres had historic water rights dating from 1874-1876. The Board supported the potential acquisition of the property and requested that the staff prepare a feasibility study for the Board’s consideration. By a letter dated November 4, 1971, Mr. Ireys was advised of the Board action and given a timetable for the required legislation and submission for a matching federal grant that would provide funds around January 1, 1973. At the Parks Board meeting on December 13, 1971, the staff presented the feasibility study, a potential development plan, and cost estimates for the next five years. The Board approved a motion to request Senator Boyd Tenney and Representatives Ray Everett and Gladys Gardner to introduce a bill to provide the authorization and appropriation needed to acquire Dead Horse Ranch as a State Park. The appropriation would be contingent on a matching grant from the Land and Water Conservation Fund. The local legislators enthusiastically supported the proposed introduction of a bill. 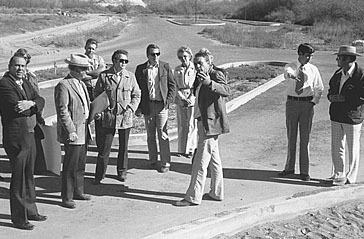 On January 19, 1972, a group of legislators from the Senate and House made a trip to Dead Horse Ranch to see the site. In the group were Senator Boyd Tenney, Chairman of Senate Appropriations Committee, and Representative Stan Turley, Chairman of House Natural Resources Committee, Director McCarthy, Deputy Director Wallace Vegors and Charles Eatherly, Chief of Planning. Charles Eatherly made a presentation to the group and showed a graphic plan that illustrated how the property could be developed as a State Park. The legislators were favorably impressed with the potential of the site. There were some humorous comments concerning going to their fellow legislators and asking them to appropriate money to buy a Dead Horse (Ranch). House Bill 2150 was introduced early in the 1972 legislative session. This bill authorized the creation of the State Park and allocated eighty-nine thousand dollars toward the purchase of the property plus another thirty acres along the Verde River. The use of the appropriation was contingent upon receipt of matching funds from the federal government to be used as part payment for the cost of purchasing and developing the property as a State Park. At the March 13, 1972, Parks Board meeting, the Director reported that HB 2150 had unanimously passed the House Natural Resources Committee and was receiving favorable attention in the House Appropriations Committee. During the hearings on this bill, and after Parks staff made its presentation, there were always comments related to the State wanting to purchase a Dead Horse (Ranch), but the humor brought on by those comments continually resulted in a positive vote for the bill. This bill became so popular with the legislators that as it made its way through the House and Senate, it was amended to include authorization to acquire land along the Hassayampa River for a state park, and also to accept 640 acres of federal land in Graham County, and authorized $150,000 toward construction of a lake. At the May 23, 1972, meeting, the Parks Board reviewed the final version of HB 2150 and expressed its pleasure about the authorization and appropriation for Dead Horse Ranch. However, there was concern expressed about the other two parts of the bill where the legislature designated what should be a State Park. The Governor approved HB 2150 on May 24, 1972. The appropriation for Dead Horse Ranch was one of the first times the Legislature provided major funding for the acquisition of land for State Parks. As the appropriation was assured for the acquisition, the Parks Board, at its May 23, 1972, meeting, approved the filing of an Application with the Arizona Outdoor Recreation Coordinating Commission (AORCC) requesting a federal match for acquisition of the Dead Horse Ranch property. The Commission reviewed and approved the funding request for Land and Water Conservation Funds (LWCF). On December 21, 1972, the Director reported to the Parks Board that the funding for the LWCF grant had been approved. Then the various required steps toward acquisition were initiated. Mr. Ireys signed the Deed selling Dead Horse Ranch to the State Parks Board on July 16, 1973. In recognition of this bargain sale, the Parks Board approved a Resolution to acknowledge his gift to the State of more than $200,000 for selling the property at a reduced price. With the purchase of the property came approximately 78 acres of fields with water rights that were irrigated by the Hickey Ditch, a diversion from the Verde River. This property was the first land State Parks acquired with associated water rights. The ditch adds to the beauty of the Park and is directly responsible for several miles of secondary riparian growth. The Park is a party to a Cooperative Ditch Agreement with other property owners also holding water rights from the Hickey Ditch. The acquisition of this Park brought some other issues that caused a variety of management problems for Parks staff. Mr. Ireys retained 1 acre of land including a guest house that was located in the center of the Park. After the acquisition, members of his family and their friends were living in the guesthouse. This property was acquired in 1977 by State Parks. Mr. Ireys also retained 18 acres on the east end of the Park and an access easement to it and another private parcel that was located just east of his property. This 18-acre parcel was acquired as a part of the Verde River Greenway in July 1986. Access to the Park was a major concern that had to be addressed. At the time Dead Horse Ranch was acquired by State Parks, there were two access routes into the Park. The closest was off Alternate Highway 89 that passed through downtown Cottonwood along 5th Street and across the Verde River. The other was a much longer route through the Tuzigoot National Monument and Tavasci Marsh coming into the Park from the north. The Parks Board passed a Resolution at its March 27, 1974, meeting requesting the assistance of the City of Cottonwood in providing access to the Park on 5th Street. At the May 23, 1974, meeting, the Parks Board decided that it needed to make an on site inspection of Dead Horse Ranch and to meet with the Cottonwood City Council to explore alternatives for access. The meeting was scheduled for June 11, 1974, at 10:00 a.m. in Cottonwood. At this meeting Parks staff presented two access alternatives (5th and 6th Streets) and recommended that the Board consider 6th Street for the access. However, after discussion, it was the consensus of the Board that 5th Street should be the access road to the Park. During the luncheon meeting with City of Cottonwood officials, Parks Board Chairman, Dell Trailor, explained the Board’s position on 5th Street and requested assistance from the City. The City did not feel it had finances available to assist the Board. Thus, the Board approved 5th Street as the access and authorized Parks staff to proceed with negotiations to purchases the necessary land based on appraised value. If the negotiations were not successful, the Board stated that it would proceed with condemnation. By the October 29, 1974, Parks Board meeting, the appraisals had been secured and the properties had been surveyed so negotiations with the various property owners could begin. At the February 7, 1975, Parks Board meeting, the Director reported that a third party, real estate agent Dottie Mabery, would act for the Board in negotiations with the property owners and staff would withdraw from the negotiation process. Also, by Resolution on the same day, the Board authorized the Attorney General to institute condemnation proceedings against any property owner not willing to sell their property for access to Dead Horse Ranch. At the March 25, 1975, Parks Board meeting, the Board had a lengthy discussion about the progress that had been made in acquiring the necessary right of way required for the new access road on 5th Street. The right of way required a 12-foot strip on one side and a 6-foot strip on the other side of the existing street. Following the discussion, the Board voted to request the Attorney General to file condemnation proceedings to acquire the remaining properties necessary for the road right of way. John Memmott and Paul Harter, of the Attorney General’s Office, filed the condemnation action on September 29, 1975, to gain immediate possession of the required properties. At the December 12, 1975, Parks Board meeting held in Tucson, Mr. Harter reviewed the condemnation action previously taken by the Board in Cottonwood. Mr. Harter reported that Judge Hancock had no formal resolution that indicated the purpose, rationale, and necessity for the 5th Street access. Following Mr. Harter’s presentation, the Parks Board approved a Resolution, prepared by Mr. Harter, that incorporated the substance of past Board actions. All of the property owners included in the condemnation action were in attendance at the meeting along with their attorney. The condemnation proceedings were held in Prescott with attorneys John Memmott and Paul Harter and Charles Eatherly, Chief of Planning, serving as the State Parks representatives. The court hearings proceeded through early 1976 and the Final Orders on the various properties were received from November 1, 1976, through February 9, 1978. The addition of this property brought the total Park acreage to 320 acres (See Appendix 2). 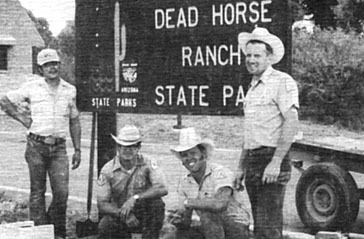 Dead Horse Ranch State Park celebrated its official grand opening with a dedication ceremony held on June 1, 1977. Michael Ramnes, State Parks Director, served as Master of Ceremony. Duane Miller, State Parks Board Chairman welcomed the visitors and dignitaries, Frank Sylvester, Director of the Bureau of Outdoor Recreation spoke of his pride in this Park because of the amount of Land and Water Conservation Funds that were received and used to match the State funds for its acquisition and development. Henry Barbarick, Verde Valley Chamber of Commerce, expressed appreciation on behalf of the Community for the new Park and Senator Boyd Tenney, Prescott, was the featured speaker. He gave praise to the Parks Board and especially Duane Miller for the roles they served in making this Park a reality. Senator Tenney was given a Certificate of Appreciation by the Parks Board for his interest in and support of Dead Horse Ranch State Park. Jon Clow was the first Park Manager.